Sometimes alignment is everything. As an amateur astronomer at heart I am fascinated by the course of celestial bodies through the heavens and how they coincide with terrestrial features (is that strange?). Buildings, lighthouses, arches, and yes, observatories all beg to be photographed as they are kissed by the moon, the sun, or the Milky Way. One example is shown in Photo 1, below. 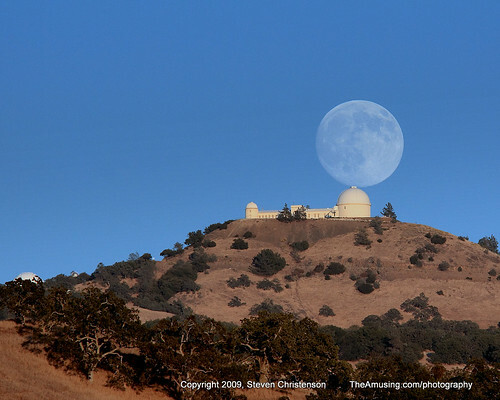 The moon is rising behind the Lick Observatory. 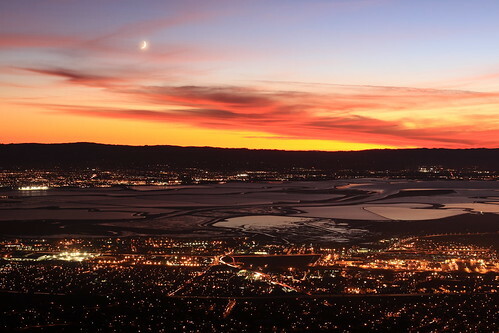 The observatory is perched on the top of Mount Hamilton overlooking San Jose, California. The photo was taken from the shore of Halls Valley Lake in Joseph D. Grant Park County Park. But it was not serendipitous – it was purposeful. Days and weeks worth of planning were required. 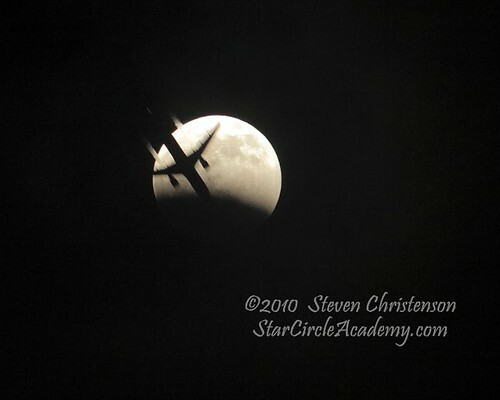 Photo 2: An airplane transits the partially eclipsed moon. 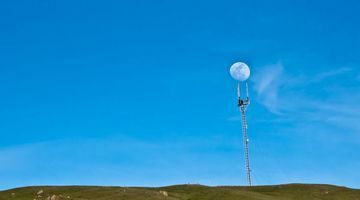 But sometimes the moon just happens to be in the right spot, as in this photograph by May Wong which captured the moon in an interesting alignment while hiking up a trail in Mission Peak Preserve. Many fascinating views of the sun and moon can be found in books by Harold Davis one particularly interesting example is “100 Views of the Golden Gate Bridge“. Photo 4: Long exposure for details during a total eclipse - notice the few stars. Indeed the moon is a very bright object as most people discover when they try to capture any of the details of the moon. Typically the full moon requires settings of f/9, ISO 100, and 1/100 of a second to preserve detail; but at night, those settings result in everything else being a deep black, therefore to get moon details and foreground details there must be some illumination. The best time is before sunrise or after sunset and more specifically the very best time is on the cusp between nautical twilight and civil twilight. I will explain what those are in Part 2. Of course the moon also makes planning harder by the changing daily illumination. In 29.53 days the moon completes one full cycle from new where the moon is in line with the sun and not illuminated; to full – opposite the sun in the sky and fully illuminated; and back to new. Surprisingly, however, the exposure needed to capture moon detail does not change very much until the moon becomes a slender sliver. When in the sliver phase longer exposures can capture moon detail in the darker (unlit) portions of the moon though this effort comes at the cost of blowing out detail from the lit edge. In the extreme case, as when eclipsed (Photo 4) longer exposures are needed. As if the changing illumination were not enough the moon’s path through the sky dramatically changes from day to day. At my latitude (39 degrees north) the moon rises about 42 minutes later each day. The compass direction (azimuth) at which the moon rises and sets also changes significantly from day to day. Capturing the moon near the horizon during twilight ALWAYS means attempting a shot of either a slender crescent moon or a full moon. In most months at most 2 days near the full moon provide full moon capture opportunities. What about the other phases? During the first quarter, the moon is highest in the sky near sunset. During its last quarter the moon is highest in the sky at sunrise. So in short, at first and last quarter you have to shoot nearly straight up to get the moon. NOTE: First quarter refers not to the amount of the moon that is lit – it is half lit – but to the phase. Similarly at last quarter the moon is also half lit. Determining the rise and set times of the moon is not hard. Many sites feature the sun and moon rise times. www.sunrisesunset.com is one site I like. sunrisesunset.com can generate a calendar for a whole month. With a little experience it is often enough to know what phase the moon is in. For me a calendar that does not feature moon phases is useless! Once I choose which direction I will be shooting, I then know whether I must shoot near sunrise or sunset. Pigeon Point Lighthouse – my nemesis – is on the west coast. To capture the moon behind it the full moon must be setting – which means the sun is rising. (It also means a 3:00 AM wake up to allow me time to drive to the coast!) Conversely when attempting to capture the moon over the San Francisco Bay Bridge, the best viewing locations face east – meaning an evening (sunset) shot is best. One advantage to attempting the full moon is that the sun’s glow illuminates the face of the foreground whereas when shooting a crescent the sun and moon are on the same side of the sky so the foreground is in silhouette. In this wide angle shot, it is difficult to even see the moon! It’s there in the upper left, but with the 10mm lens the entire moon occupies about 467 pixels out of the 15,154,290 (15M) total pixels. That’s a paltry 0.03 percent of all the pixels in the image. Of course the moon is not tiny, it is very large but it is so far away that its angular size is 1/2 of a degree or about the width of your pinky finger at arms length. Photo 5: 20mm Focal length = tiny Moon... did you spot it? Often my goal is to include a moon in a way that shows it large and well featured relative to the foreground. There is no practical way to get closer to the moon, so the way to make the moon larger in the frame is to use a telephoto lens (as in photo 1 and 2). Putting the moon near some foreground element allows me to exploit the large moon phenomenon as shown in Photo 1. But it is not enough to use a telephoto lens – I must also be far enough away from the object in question so that the apparent (angular) size of the moon is nearly equal to the angular size of the foreground object. The proper distance can be measured with the pinky fingernail at arms length, or calculated with some trigonometry. In Part 2 I’ll supply a simple formula that works well. Meanwhile Figure 1 illustrates the challenges involved in positioning and “sizing” the moon relative to a foreground object. Figure 1: Relative sizes of the moon based on distance from the foreground object. See notes. 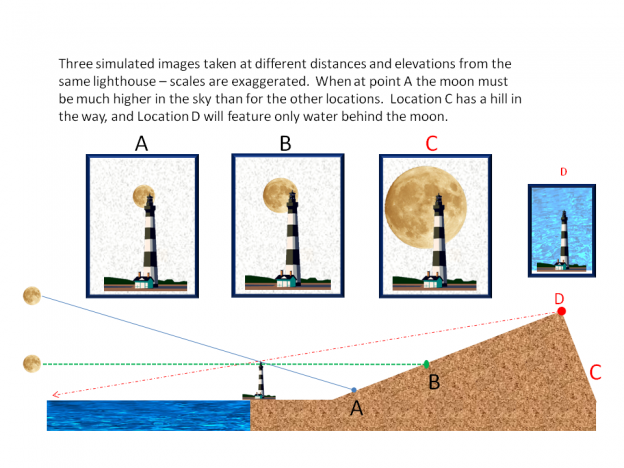 NOTE: To keep the lighthouse the same size as shown in images A, B, and C above the focal length must be increased. Alternatively, using one fixed focal length pictures B and C can be cropped from a larger photo. Looking straight up there are about 50 kilometers of atmosphere to diminish the quality of a photo. Looking toward the horizon, that number is effectively 38 times as much! The sky must be clear of clouds and haze through the entire distance. And a more sinister thing occurs, too. The atmosphere bends the light. When objects like the sun or moon approach the horizon the atmospheric distortion can become quite noticeable as a vertically flattened object. And finally, due to refraction when the sun or moon appears to be setting, it in fact has already fallen below the horizon and remains visible only because of refraction. The take away here is that trying to capture a detailed moon at the horizon is not as effective as capturing the moon at least a few degrees above the horizon. The moon’s current illumination must be managed. The moon’s rising (or setting location) must be accurately calculated. The location chosen must have an unobstructed view of the sky toward the desired direction. To get a “big moon” it is necessary to get far enough away from the foreground to get the relative moon size as desired. If too close, depth of field problems arise. Capturing a shot of the moon near the horizon means the atmosphere must be relatively clear of clouds, dust and haze. Too low in the sky means there will be significant distortion from the atmosphere. So there it is: all the complications that must be overcome in order to capture the moon. I just have not written HOW to overcome all those obstacles, that information is coming in the next installment. This entry was posted in Astronomical Event, Creativity, High Dynamic Range (HDR), Image, Lens, Photo Tip and tagged altitude, angular size, azimuth, celestial alignment, depth of field, direction, elevation, foreground, illumination, large moon, moon, planning, telephoto, twilight on June 10, 2011 by Steven Christenson.